The rally is being held in Paraguay, Bolivia and Argentina from 1 to 15 January. The vehicle has proven the efficiency of renewable energy in top-level competition, having ended the last Morocco Rally in fifth place in its category. ACCIONA, the Spanish infrastructure and renewable energy multinational, is taking on the challenge of the Dakar Rally once again with the only vehicle, among 491 participants, that will not consume a single drop of fuel or emit a single molecule of CO2. This 39th edition of the Dakar Rally runs from 1 to 15 January on a route through Paraguay (the 29th country to be included), Bolivia and Argentina. The route, which the rally's sport director, Marc Coma, describes as "the toughest route in South America," consists of 9,000 kilometres divided into 12 stages, half of them at altitudes of over 3,000 metres. 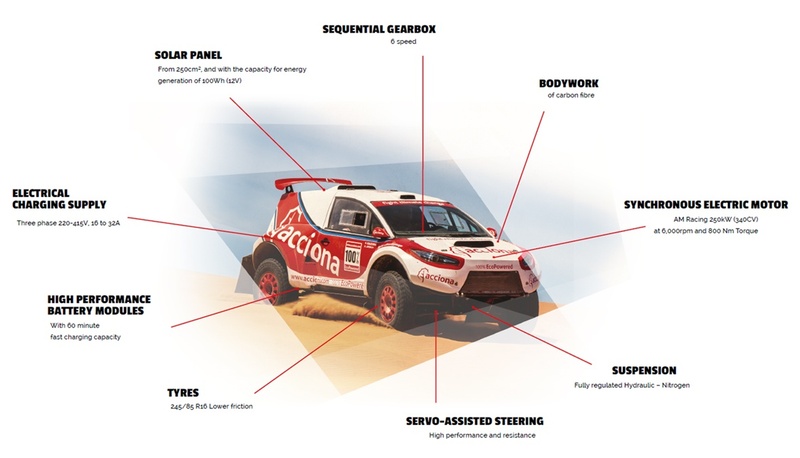 Having finished the Morocco Rally in fifth place in its category of 4-wheel drive vehicles, the ACCIONA 100% EcoPowered will again display the potential of renewable energies as an alternative to fossil fuels in the world's most demanding motor race. The car is to be driven by the same crew that successfully completed the Morocco event and competed in last year's Dakar: pilot Ariel Jatón, who also conceived the improvements made to the vehicle, and fellow Argentinean, Tito Rolán, as co-pilot. "we are really excited to be participating, and more driven than ever. We've been preparing for three years, having driven over 15,000 kilometres, so if the old saying about 'third time lucky' is true, we will be going all out to reach the finish line." This ACCIONA project lends visibility to its defense of the environment and its position combating climate change, aligned with the agreement signed by 195 countries at the Paris Summit, which came into force recently. The ACCIONA 100% EcoPowered is the result of ongoing research and development since the idea was conceived by ACCIONA's R&D and Innovation Department in 2012. It is the world's most powerful electric car — 250 kW, equivalent to a 340 horsepower combustion engine — thanks to an innovative power train comprising a synchronous electric motor, six fast-charging on-board batteries and a backup instrumentation power system driven by a high-performance rooftop solar panel with a rated capacity of 100 Wh. Technical improvements have been made this year that enhance the vehicle's reliability. They include a chassis re-design, lighter batteries, a six-gear sequential gearbox and enhanced 4-wheel traction.